So today when I left work at 6 pm I went straight (I stopped at Subway first for a quick dinner) to the store. 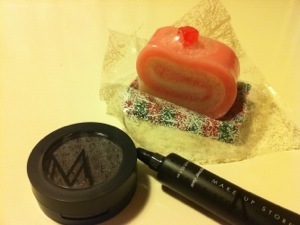 Except the eyeshadow I also got an eye primer and a cute little soap which looked like a cake. These are only available during the winter season as its s limited collection. They also had lip gloss in small cupcake containers. I’m thinking mostly teenagers will buy that one! Even I who love cupcakes thought that was a little too much. Another thing happening today was that the first snow for the season decided to greet Linköping. It was very weird though because it was snowing heavenly when I left work and I was so happy I have a hood on my jacket! 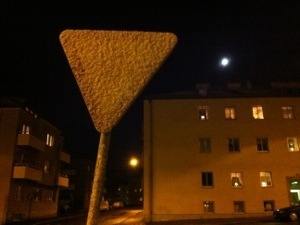 When I came in to town (~2 kilometer) it didn’t snow at all! When I walked home from the bus stop I managed to find a little snow to take a picture of!